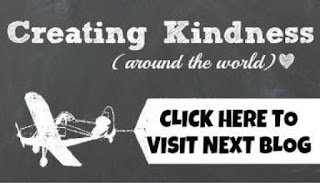 Hello and welcome to this month's Creating Kindness (Around the World) Blog and Video hop (yes, we really have a video hop on YouTube)! If this is your first time to my blog, my name is Maria Willis, and I'm a Stampin' Up Demonstrator from a small mountain town called Boulder Creek, CA in the United States. I'm so glad to have you here. Today our theme is "Texture" and our design team has done our best to bring you some creative ways of adding texture to your own crafting projects. For my card I decided to use Stampin' Ups! new Embossing Paste. It's great for adding texture to any project. 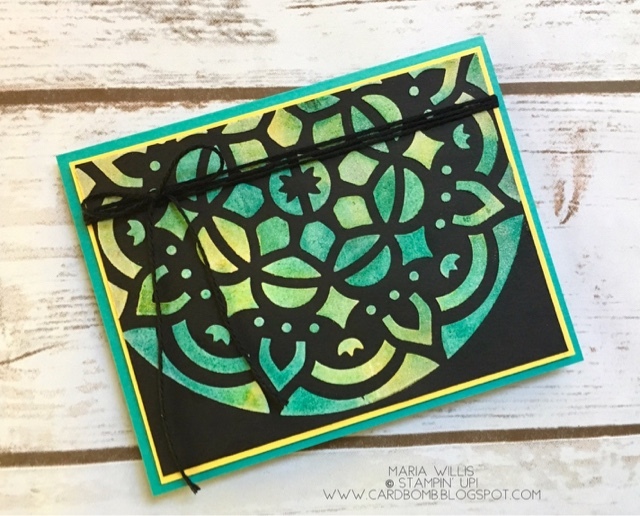 I decided to keep my card simple to let the medallion pattern and vibrant colors take the spotlight. 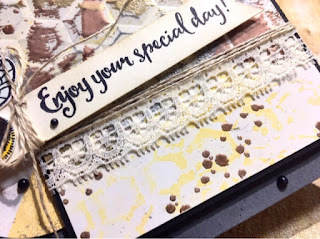 On this card I used a color combination of Daffodil Delight and Bermuda Bay. I used Basic Black cardstock in hopes of having the colors boldly pop off of the page and I like the way it turned out. After applying the paste and letting it dry I used sponge daubers to apply color. The sponge daubers allowed me to apply the color lightly or heavily as I pleased. It also turns out that black is a good color to use as a background for this embossing paste as it provides a very forgiving background. If you watched the video you saw that the card I featured today is actually the second card that I made using this technique. The first card was more of an experiment that started with spritzing color onto the embossing paste (it worked but the color faded over the course of the week). Once I realized that the color was going to fade with the spritzing technique I decided to try with sponge daubers and I was able to get much more saturated color with this technique. The Clear Wink of Stella is a fun addition but not just because it sparkles. In the video you can see that the solution in the Wink of Stella helps to drag the ink color around blending the colors seamlessly. Here's a look at both of the cards. 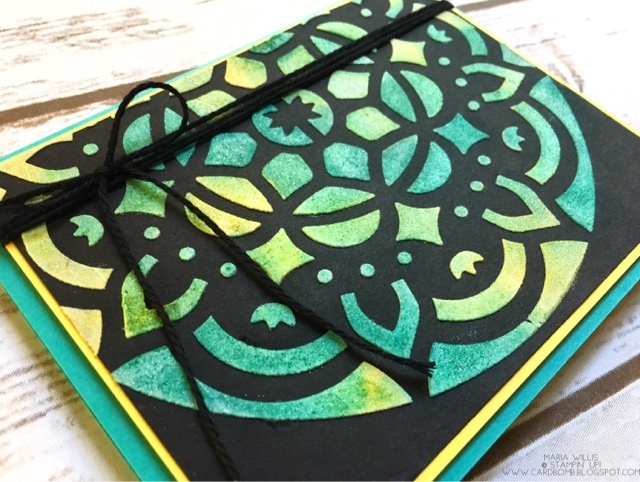 My original card was done with Lemon Lime Twist and Island Indigo inks. The colors aren't all that different but the Daffodil Delight and Bermuda Bay card is a lot more vibrant. 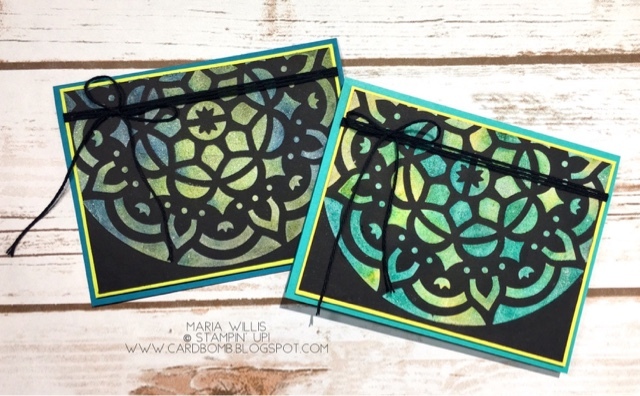 If you're interested in creating texture on a project without using embossing paste then check out my post from yesterday. Here's a link and a sneak peek... just click HERE. That's it for today folks! 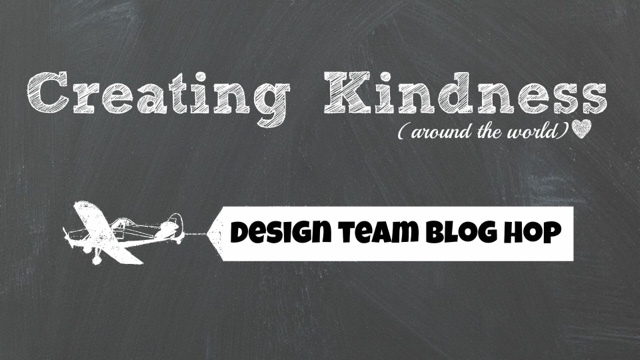 I hope you'll keep on hopping along with us to see the amazing ideas the rest of the design team has to share. Next you'll be heading over to Satomi Wellard in Japan! Wow, Maria! Sponging the paste is a genius skill. And sparkly too? This card is super. Well done! I've tried coloring on embossing paste on the whisper white card stock but never thought of using black card to put the paste on!!! It looks amazing. Thank you for the great idea. I'm always in awe of your colour choices as they're always so vibrant and works well together. Great tip using black card to colour the paste too!